When Jen Fay is mentioned, the first thing that comes to mind is her illustrious basketball career, in which she shined every season she played for Quinnipiac and became a legend in Hamden. 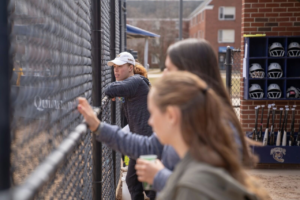 But immediately following the conclusion of her fourth and final basketball season on the court, Fay decided to try something entirely new by joining Quinnipiac’s softball team. As a basketball player at Quinnipiac, Fay scored 1,315 points in her career. Her career-high statline in basketball reads 13.3 points per game, 6.8 rebounds per game, and 2.7 assists per game. So when news broke that Fay had joined the softball team, many found themselves in disbelief. While it’s definitely foreign territory for many Fay fans, it’s anything but for Fay herself. Despite the fact that she always wanted to play, it wasn’t as simple as just a desire. Fay had a responsibility to fulfill with the basketball team, as the winter sport was the reason she came to Quinnipiac in the first place. The risk of interfering with her ability to play basketball was too great to allow Fay to play softball as well. “Because I was playing basketball, I couldn’t really take the risk to play softball in the spring because basketball is my main sport,” Fay said. “If I were to get hurt that would not have been a good situation. While focusing solely on basketball, Fay became a star on the court. She played a key role in helping the Quinnipiac women’s basketball team to the Sweet Sixteen in 2017. By winning three consecutive MAAC championships as well, Fay helped to establish the Quinnipiac women’s basketball program as a legitimate and relevant one nationwide. However, her focus has now shifted from basketball to softball. The opportunity to join the softball team is one that Fay hasn’t taken for granted, and she expects to make the most of it. While Fay acknowledges that her impact on the field may not match the level it did on the court, she has her mind set on helping improve her new team in any way possible. The team has gone 4-0 since the addition of Fay, but the sudden success is due in very small part, if any, to Fay’s presence. Fay had attended only two practices before the double header sweep against Manhattan on March 30. Still, Fay is excited to be a member of the team and hopefully have an impact moving forward. Despite the fact that Fay hasn’t been able to play a game so far, joining the softball team has been five years in the waiting, and she’s finding plenty to be excited about. During her basketball career, Fay managed to “make the most of it” by picking up a hobby: vlogging (or video blogging). Throughout her senior year, Fay made videos depicting what it’s like to live a day in her life or the life of her teammates. She’s amassed 142 subscribers on YouTube and averages 393 views on each of her videos.When it comes to softball, she plans to keep the vlogs going. “I did bring the vlog out for a few clips,” Fay said of vlogging during her first games. “I’m going to ease into it. It’s a new team, obviously I’m not as comfortable with everybody yet, so even myself, I feel like I’m a little camera-shy right now. Fay joined the team well into the season, but hopes she can still experience fun and success for the remainder of the year. The Bobcats (7-18 overall, 2-0 MAAC) still have 27 games remaining on their schedule, possibly more if they make the postseason. It will be interesting to see the impact that Fay has on the team over the next five weeks. For now, she can enjoy that she remains a member of a team and is able to contribute to something larger than herself, whether that’s on the field or not.